A curious subculture of extreme DIYers-turned-home theme park designers illustrates how the US revels in Halloween, a less-regarded festival on the other side of the Atlantic. A 30ft monster? An illuminated pumpkin the size of a family car? Or a mock graveyard complete with pneumatically-operated skeletons? Welcome to the world of the "home haunters", Americans who dedicate months of every year to putting together the ultimate amateur Halloween display in their front garden. 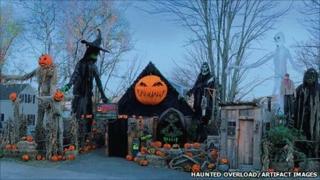 Walk past these enthusiasts' homes at Halloween and you can see the DIY versions of all of the tricks of the Ghost Train ride at a real theme park. Ghosts flutter in windows, graves spring open and skeletons pop up and talk. There is no commercial element. Just legions of parents and young trick-or-treaters who turn up at suburban front gardens to see how far a hobby can go. Eric Lowther started as a home haunter in Exeter, New Hampshire, in 2001 and by 2006 things had started to get out of hand. "It got to be so big we had to block up the road and we had 5,000 people. There were way too many people." Mr Lowther had to move his display from his home to a farm where his imagination could run free without causing traffic jams. He raises money for charity but otherwise is only motivated by love of Halloween. "I've always loved scary things. Halloween lets you get so wild on the imagery." There are thousands of home haunters in the US, just like Mr Lowther. "I run a site that connects all these Halloween crazies," says Steve O'Connor, from Providence, Rhode Island, who is the custodian of Garage of Evil Network. "We are a niche within a niche. I spend a large portion of my year sitting in my garage workshop custom carving tombstones." Like many home haunters, Mr O'Connor has become something of a jack of all trades, learning to weld, build pneumatic-powered devices, tackle advanced electrics and software coding. The home haunters are at the extreme end of the Halloween spectrum, but it's easy to gauge how seriously the US takes Halloween. Spending on the holiday rocketed during the last decade before stabilising as the downturn kicked in. Image caption What could be more natural than a giant grim reaper in the driveway? This year Americans will spend $5.8bn (£3.6bn) on Halloween, according to the National Retail Federation. A survey by market research firm Mintel found 23% of Americans would buy special decorations for their home, the second largest proportion for any holiday, after Christmas. In the UK, Halloween has to compete with Bonfire Night just a few days later. Both occasions echo elements of the Celtic festival of samhain. Some in the UK see Halloween as a festival susceptible to American influence. Britons used to carve turnips into lantern, but now the pumpkin has achieved transatlantic dominance. You can find evidence that the UK is taking Halloween more seriously. The British supermarket chain Waitrose - which releases very detailed sales figures - is selling 13% more pumpkin carving kits, 21% more decorations and a scarcely credible 676% more large pumpkins than last year. But it would be hard to argue that the UK even comes close to matching the US in the sheer visible exuberance of Halloween. The build-up to Halloween in the US lasts weeks, wrapped up in some places with harvest festivities and the like. You can drive around a rural area and see corn dollies and carved pumpkins. In the cities, even the tiniest front garden can accommodate a plastic gravestone or two. While it originated in the UK, Halloween started to take on an important, communal element in the early 20th Century when it was something that could be celebrated by a range of immigrant communities, says Lesley Bannatyne, author of Halloween: An American Holiday, an American History. "It was celebrated as a great, big town-wide party. Halloween from that point on has always been a large American holiday." It went up a gear in the 1950s and 1960s spurred by the baby boom. "There was a huge burst in the building of suburbs," Ms Bannatyne notes. "It made trick or treating wildly popular." Since then, a sort of feedback loop has occurred between the holiday and US popular culture. A link to horror films cemented the appeal for teenagers and young adults. As well as parents and children, Halloween is also very much about students and twentysomethings having raucous costume parties. In the last 10 years the greetings card and plastic decoration firms have more thoroughly exploited Halloween. "It used to be that 10 years ago people were making their own tombstone decorations - now you can get a really gorgeous looking tombstone for $8 (£5)," says Ms Bannatyne. There are workers in Chinese factories bemusedly creating these plastic gravestones, she suggests. For Tina Reuwsaat, Halloween is a chance to turn her home in Medford, Oregon, into Darkwing Manor and Morguetorium Museum. "My husband and I are ancient Romanian vampires. We have opened this old Victorian manor for all kinds of other lost souls to join us," she says. Ms Reuwsaat has been doing the home haunting for nearly three decades, with the emphasis on antique memorabilia rather than modern horror. The exhibits are indoors as well as out. "There's no gore, chainsaws and Freddie Kruger. Instead it's witches and fairies and magical things. "We are not sacrificing small animals to Satan. It's just a fun holiday and a chance to raise money for abused children." While home haunters do not make money out of their displays, many find themselves being recruited by businesses to replicate their work. Mr O'Connor has done designed for theme parks and worked at attractions. But he would never let it detract from his home display. "If I stopped doing it the neighbourhood children would probably attack my house." The exuberance of the home displays may offer a clue to the transatlantic divide. In the US, the festival acts as a bonanza of personal expression. "People are free to express whatever we value or like about in the way no other holiday does," says Ms Bannatyne. "Your costume is a form of expression - your front yard is a form of expression."